Last week, my old wireless router died on me. Actually the power supply stopped working. It was a topcom router, I bought at aldi, for just under 80â‚¬ a little more than three years ago. So the warranty had only just expired for a couple of months. It had been acting strang lately, losing dns-caches and disconnecting wired clients, for no obvious reason. I was still very happy with it. It was cheap, fast (108Mbps wireless), secure and reliable. It came with a wifi-usb key too, which I rarely used. If someone has a spare 5.0V Â DC 2.0A power supply, just let me know 🙂 I used to experiment a lot with that little router. Once I made a parabolic signal director for it, boosting its range to up to 300m. So last week, I searched for a solution. I wanted a cheap, but comprehensive solution. Something I could use to play with a bit, without spending too much money. I started reading some reviews, and found that the Linksys WRT54GL is a favourite among open source firmware enthousiasts. I found that it looked ugly and was more expensive than the WRT54G2. I found that the WRT54G2 too is supported by DD-WRT, a fully featured open source firmware. So I ordered it from routershop.nl, and two days later, yesterday, it arrived by mail. This device looks nice, an important point for me, because It lives next to my TV, in the living room. I played with it a bit, but found that out of the box, the possibilities for configuration are rather limited. So I flahed it with the new firmware. This page details the process, which is actually rather painless. There were only two (known) problems I encountered. The first is that the tftp program for sending the new firmware to the device didn’t work under windows Vista. This was not a problem for me, I just booted into XP and everything worked as described. The second problem was that after setting a new password, I couldn’t save any of the settings I wanted to change. I did the 30/30/30 reset, which means pressing the reset button for 90 seconds, while killing and restoring the power to the device after half a minute. After that I was able to configure the device to my liking. I was very impressed with the possibilities the DD-WRT firmware opens for such a cheap device. 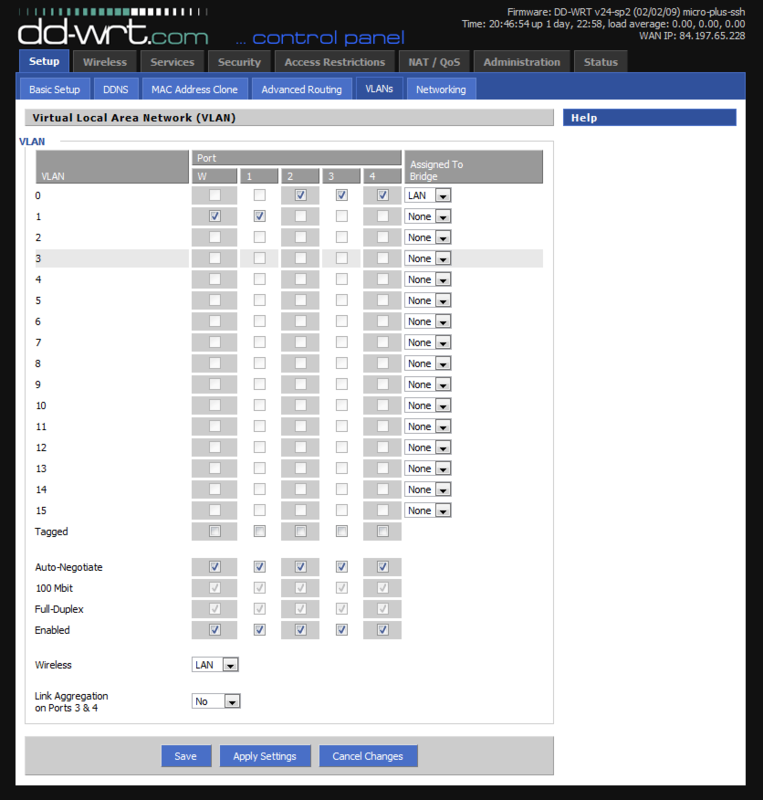 DD-WRT control panel. Very user friendly, every setting at your fingertips. In a next post, I will describe the network topology I realized with it. I used to need an extra network-switch to give an external IP to my telenet digibox/digicorder.